In the first of a series of guest posts, award-winning chef James Sommerin gives us some Autumnal ideas for root vegetables and provides a great recipe for all the pumpkins that are available this time of year. As the chill starts to creep into the air and the leaves turn a burnished orange my thoughts always turn to warmth – the glow of fires, hearty stews and cosy evenings in. There’s no better food type to embody this than the root vegetable but sometimes people are stumped about what to do with them and quite frankly put off by their appearance. Over the years we’ve become a bit more accustomed to seeing sweet potatoes, celeriac and even yams alongside turnips, carrots and swede on our supermarket shelves, but I find all too often people might like the idea of them but simply don’t know where to begin. A good starting point might be a simple creamed root soup, roasted vegetables to accompany roast lamb or a traditional cawl with parsnips and swede. Here at Restaurant James Sommerin we’re serving beetroot alongside Pant-ysgawn goat’s cheese which is not an automatic but works fantastically. Another pairing which is going down well is our vegetable salad with hazelnuts, which adds some depth and seasonality lighter summer salads. Roots work brilliantly with an array of other ingredients and seasonings. Try adding coconut milk to soup or coating parsnips in honey or maple syrup mixed with orange or cinnamon, perhaps sprinkled with pecans. A balsamic vinegar or syrup can really liven up a warm root vegetable salad, especially beetroot. And now for one of the highlights of fresh produce this season, but not only is it not a root vegetable, you may be surprised to know that the piles of pumpkins you’ve been unable to ignore for the past few weeks are not vegetables at all but actually piles of fruit! But while we’re used to their yearly fleeting appearance the proportion of the them that are used solely as lanterns, with the sweet flesh discarded is likely to be huge and a real shame. So if an American style pumpkin pie isn’t quite your thing …..
Why not try my Pumpkin Crumble? 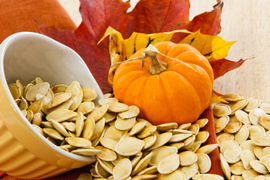 Remove the flesh and seeds from the pumpkin. Roast in tin foil with a little olive oil for 30 minutes at 180ºc or until the pumpkin becomes soft. Once the pumpkin is roasted place into a pan with the chilli, butter and add the milk. Bring to the boil, extract part of the liquid and blend with a hand blender until smooth. Pass through a sieve to create a purée. With the 100g of diced pumpkin, blanch in boiling water for 30 seconds to a minute then roast in a pan to add the flavour, maybe add a slice of garlic or rosemary. Add the roasted diced pumpkin to the the pumpkin purée. Add the 50g of fresh parmesan and stir to a thick paste. Transfer the pumpkin mixture to an oven-proof dish, top with extra grated parmesan, and, for an extra additional flavour add some toasted pine-nuts or breadcrumbs. Cover with either tin foil or a lid and bake in the oven for 7-10 minutes at 180ºc. This will help to toast the top of the crumble. Remove the tin foil and bake for 1-2 minutes just to finish the top completely. Serve with fresh bread.